INDUSTRY.co.id - Tangerang - Utilization of technology is part of the step Atma Jaya UNIKA ("Atma Jaya") in digital and going global transformation. Atma Jaya now uses four softwares in administrative and educational systems, namely Oracle Campus Solution, Zendesk, Microsoft Office 365 and Augmented Reality (AR). "In the current technological era, the use of technology becomes the main thing. 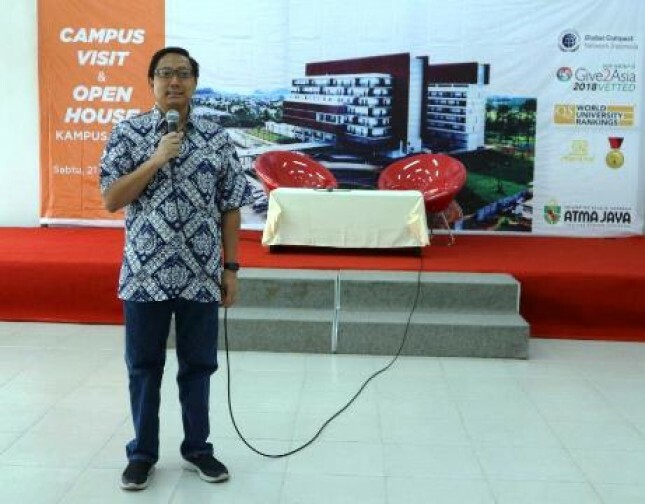 Utilization of technology in Atma Jaya education system is a step of digital transformation taken to be a digital campus with the concept of Atma Jaya Digital Working Space," said Atma Jaya Unika Rector, Agustinus Prasetyantoko. Welcoming the new school year this time, Atma Jaya opens the opportunity for prospective students to visit Campus 3 BSD, South Tangerang. As a leading Private University in the use of technology, Atma Jaya introduced the digitalization education system and a series of educational programs through Open House activities. Each student has access to My Atma, the administration system in the form of academic status, cumulative grade point average (GPA), and assessment can be viewed online. In addition, Atma Jaya also uses Zendesk software for student administration services digitally so as to facilitate students in meeting the needs of information and campus facilities. Through this Open House activity, Atma Jaya also announced that Atma Jaya is now being transformed globally through the cooperation that has been established with 66 educational institutions spread over 5 continents. "Atma Jaya is currently working with 66 Educational Institutions from various continents. Through this cooperation aims to create high quality graduates from Atma Jaya who are ready to compete in the global economic market and also digital. The forms of this cooperation include exchange of students, scholarships, internships and research," explains Agustinus Prasetyantoko. One member of the student exchange scholarship recipient, Sharon Novita Herlambang, has joined the student exchange program at Kanda University of International Studies, Japan. For one year, a student of Faculty of Education and Language (FPB) Atma Jaya Unika is a tutor for Kanda University of Internatonal Studies students in learning Indonesian Language and Culture. "It's great to have the opportunity to learn Language and Culture in Japan through this scholarship student exchange. In Japan, I really learned a lot, not just learning the language but also the culture inside and outside the campus. Many experiences that I get that can be stocked in the future," said Sharon Novita Herlambang on the opportunity Open House, Saturday, April 21, 2018. Open House this time as part of a series of new admissions program begins with online and offline registration on March 26 to March 26, 2018. Then proceed with the Atma Jaya Entrance Selection Test will be held next 28 April. The results of the Atma Jaya Entry Selection Test will be announced on May 7, 2018.